Happy Friday Eve! Half of me is still expecting another sweet bank holiday as we've been spoilt with them recently - guess it'll finally hit me as I'm going to work tomorrow and on Monday...I really must get used to the idea of working on those days again LOL! Anyways you know the deal, right? It's Friday Eve and so it's time for another fabulous CASE study. AND seeing as it's a new month, it's time for a new muse! Now this month's muse is someone whose blog I stalk frequently and whose style I truly admire but could never pull off myself (gonna be learning a lot from CASEing this uber talented lady this month methinks! )....any guesses who? Yup, it's no other than Sarah Martina Parker! You can check out the original post of this card here! Y'know every time I admire this card, I discover something new that I hadn't spotted before - it's full of treasures! I loved the white embossed panel on the kraft cardstock so that was the first thing I did! The rest of the card kinda fell into place: I played with a button for a while but it just wouldn't sit nicely anywhere so I left it off. Not sure if it's too plain but I can tell you that the gems sparkle much more IRL! I'm signing off now to go and vote today. We've got an election and voting is something that I'm really passionate about - it you don't use it then you lose it! We just had an election to raise money for our schools this week. Thankfully it passed as most in our area did not! Love your CAS style and of course the touch of green ribbon - true Aimes style! I just love this simple layout and the colors are fabulous!!! Clean, simple and wonderful! Great card Aimes! Always love your clean and simple takes on Muse's shabby chic cards. Fabulous color choices! Saw marshmallow fluff in the grocery store the other day when my sister picked some up to make some fruit dip-had to tell her all about you and how you don't get it much! Love that you're going to CAS up a non-CAS card, we've all gotta take the parts we like and make them our own, the white embossed label is great. 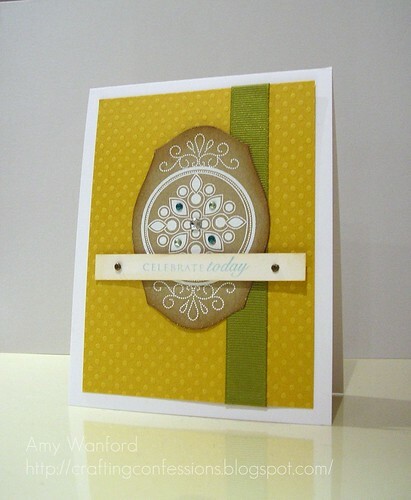 Love your card Aimes, the color combination is just perfect! You are fabulous at "CAS-i-fying" a card...just love it! Fabulous, Aimes--love your color combo. I always enjoy seeing your CAS versions--beautiful as always! Aimes, I love your CAS take on Sarah's card! The white embossing on the kraft is fabulous! SO agreeing with Andrea here - your skills in CAS-i-fying are magnificent :) I see the layout perfectly, and I *LOVE* your bling accents! How fun! What a great take on the CASE challenge card! This color combo is so vibrant and cheerful!! FABBY work! LOVE that mat stack die turned on its side and the strategically placed bling!! !